fixed Rehras sahib and Aarte baani's content and fixed GurugranthSahibJiDB. It was not searching few gurbani's in offline mode. 2) User can click on a line in Daily baanis to see the meaning of the line. This feature was demanded by many people so that they can see meaing f a line while doing nitnem baanis or baanis from sunder gutka. 5) When looking at shabad back and forth after doing search Highlight text used to disappear. That issue is fixed now. 4) Feedback form is now simple. Send email button is moved to top now.Earlier it was hiding behind the keyboard unless you click else where. 5) In Kirtan and Radio channel many Kirtan videos has stopped playing in last releases. I have tried fixing that issue in this release. 6) In light background theme for phone.. default Text color for baani is converted to Black instead of accent color. For Dark theme, it is White instead. 1) in gurbani search engine when you see a particular page it was not showing full ang contents in full screen Page view mode.It is fixed now. 1)sometimes when we open a Shabad, it doesn't start from the beginning, but it starts from the line with which we have searched that Shabad. 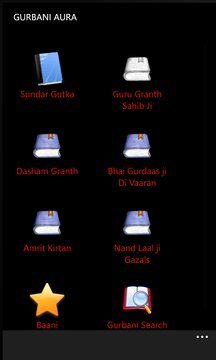 2) Full screen mode has more space now in Granth sahib ji Search Engine. 4) App has been upgraded to wp8.0 app. It will now be visible in Windows 10 store as well. 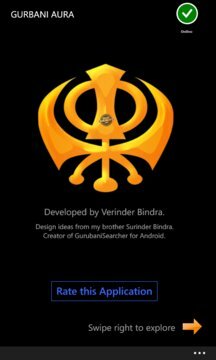 2) Kept the previous swipe mode with scroll view because it helps navigate from one shabad from other shabad without searching for next shabad if you want to read shabad by shabad in sequence. 3) reduced the fonts in Gurbani search page and search result page. "Gobind Jio tu mere praan adhaar" shows next line in same shabad instead of line searched for. 6) Fixed Gurmukhi keyboard and Hindi Keyboard so that now you can search shabad which has akhar like "Uper" eg "ijs ky isr aUpir qUM suAwmI so duKu kYsw pwvY" has Uper as fourth word. It was happening because Keyboard was mapping letters badly for that. It is fixed now. IN Gurbani radio selecting an artist was not working consistently when you go back and forth from no selection to some selection. Chaupai sahib in hindi is fixed. Screen lock is disabled if user selects that option while installing the app. I found it more useful to have it disabled when reading banis. Login time reduced to 0 seconds. Now application connects to online after coming to offline mode. This will help people with slow internet connection. they can now do offline reading without waiting for application to become online. fixed bug in bangla sahib katha channel and manji sahib channel. it was not playing from 1-9th of the month. 1) added Bangla sahib Katha and Manji Sahib(harmandir sahib) katha channel. Many more would be added in next few days using the same version of the app which i am uploading now.